The second of our recent “Online Store” projects has just gone live (the first being iCandy Gifts, which we’ve just spruced up for Valentines Day), redeveloping Stoned Boutique’s web site. We were brought it to redevelop Stoned Boutique’s online store to make it searchable, introduce categories, and make the whole site user friendly – for example, making new items easier to find, and highlighting promotions and sale items. Their old online store was maintained by their designer, which meant they had to pay their previous company for each update (including the addition or modification of new items of clothing). Our new online store for Stoned Boutique allows them to update the site themselves, as their stock changes and they bring in new designs, and they’re using the system as a reliable way to maintain stock levels too for when they sell offline. Style wise, we wanted something eye catching and recognisable, and also something which we can develop into a brand that we can incorporate into their Flash portfolio site which should be launching in February. 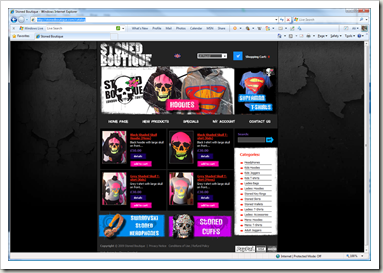 The web site can be found at http://www.stonedboutique.com – take a look!